Pellets found by Theo Tamblyn, June 11 and July 2 2008, Colchester, Essex, England. Theo, 11, found altogether three pellets during his stag beetle monitoring. He found them underneath trees in his monitoring area, which was in south-west Colchester, a stag beetle hotspot. Besides the pellets, his sightings were 73 males (18% dead), 18 females (33% dead), and 20 unknown (85% dead), from May 21 till July 15 2008. 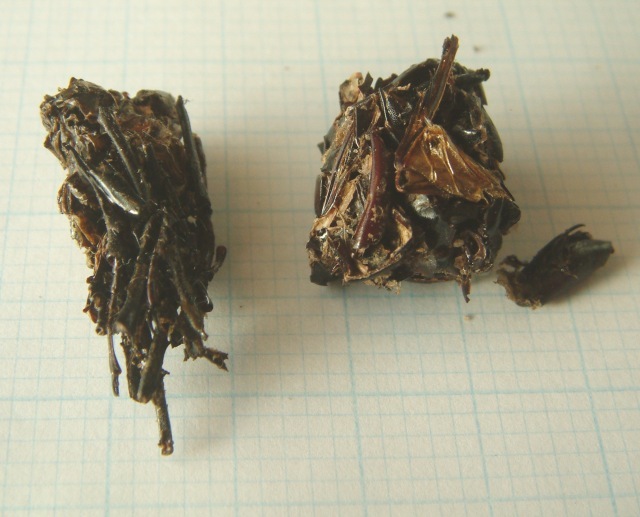 It is the first time that bird pellets with stag beetle remains have been found in this area. The first guess was of a member of the Corvidae family, which are very common in the area and are known to feast on stag beetles; but usually they leave behind characteristic corpses without the abdomen. Next, would be either an owl or another bird of prey, like a kestrel. These birds are known to eat they prey whole and then regurgitate the undigested remains. In the past I have found pellets of these elusive birds, close to our house. They had only vertebrate bones in them, though. Congratulations to Theo for such remarkable find and thanks for sharing it with the website. In Germany Christian Molls has also found a bird pellet with stag beetle remains. It was on the pavement and he thinks that it might be an owl pellet. See below. Pellet with stag beetle remains, 21 June 2015, Baesweiler, near Aachen, Germany. Photo courtesy of Christian Molls. It is rather broken up, and perhaps mixed with fur from a vertebrate, but the stag beetle remains seem to dominate. Congratulations to Christian as well for such a good find. As in both cases the real culprits remain unknown, next time someone finds bird pellets with stag beetle remains, please, take them to a bird expert. In any case, do get in touch with me as I would love to have more examples of this type of predation.